With spring on it’s way and summer following closely behind, it is time to start brainstorming some ideas on how to spruce up your outdoor living areas. Whether you are looking for some trendy decor, ways to set up a lounge area on your deck, or simply are here to remind yourself ways to prepare the exterior of your residence for the warmer months ahead, here are some ways to freshen up your outdoor living experiences. Hang rain chains that create soothing musical sounds during both heavy and light rains. These can be made of metal plates, brass cups, or plastic beads, and can be hung around windows, a gutter, or by a pergola near your deck. They look very beautiful and are seen as an art form by the Japanese as they produce gentle sounds as rain hits them, almost like a windchime. Having plants growing in stylish pots and placed around your home, deck or patio can be a beautiful and easy way to bring color to your home. Watch as bees and hummingbirds come by to enjoy as well! Building a pergola to let plants grow from can add a fresh twist to your exterior. A pergola will provide shade in the heat, and protection from rain, as well as allowing you to enjoy the fresh air while sitting under your plants that hang from above. Having a cozy spot outside for lounging is essential. A hammock could be the perfect fit for you and your patio. Find a sturdy area of your wall, using strong, large nails that will hold you and the hammock. Add some fun color by spray painting old furniture with bright, summery hues. You could also buy inexpensive waterproof fabric pillows and cushions to place on wicker furniture to use as accent tones. Increasing the amount of bright colors you have outdoors can heighten happiness as well as set a positive mood for friends and family. Don’t forget to check the screens of your windows and doors for any holes or tears, as these can easily be fixed with clear fishing line, super-glue, and if needed, a new patch of screen. Any holes can let in pesky bugs, which is never wanted; a screen for windows or sliding glass doors should only let in the cool breeze on hot days. If you already have a deck or patio attached to your home, make sure the wood floor paneling is not warped from rain, there are no missing or rotten boards, and the siding of your home around the living area is still intact with no problems occurring. 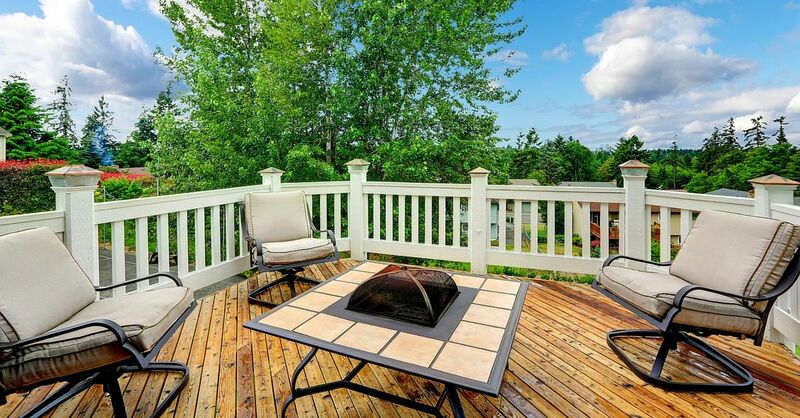 If there are major issues, make sure to call your deck contractor. If you do not have a deck and are thinking of installing one this spring, call a deck contractor such as Straight Line Construction to talk over which style is the best fit for you and your home.